How you viewing the excel ( xls ) or word ( doc ) file in internet ? Normally we will save it in computer then open with office application software that already installed in computer.Now you no need to install this kind of application software and can direct view it online,what you need is a Firefox web browser only. 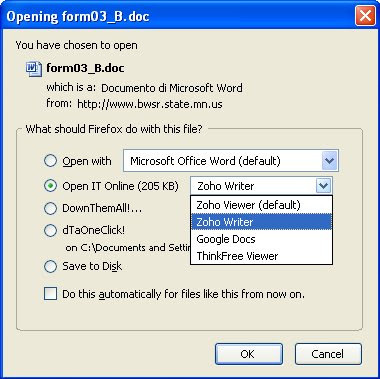 Download Open IT Online addon and installed .There are total 4 online service document viewing and editing and you can choose which one you preferred. PS: Open IT Online not supported PDF files . Extensions Firefox 3 BetA 3 Can’t Use,How To Settle ?